bl.uk > Online Gallery Home	> Online exhibitions	> Asia, Pacific and Africa Collections	> Kazmain [Lucknow]. This photograph of Karbala Kazmain from 'The Lucknow Album: containing a series of fifty photographic views of Lucknow,' was taken by Darogha Abbas Ali c.1874. 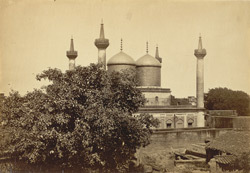 Karbala Kazmain, a Shia shrine, was commissioned between 1837-1856 by Sharfuddaulah.